Add Attribute allows for a new sample attribute to be added. It can be any string, but if this attribute is a sample input (eg ‘vegetation scaling factor’) the string must match a column header string in the csv file when a dataset is imported. Edit Attribute allows for an existing attribute to be modified, but only if it is not already in use by a sample or experiment. Remove Attribute allows for an existing attribute to be deleted, but only if it is not already in use by a sample or experiment. Attribute is the name of the sample variable. Output Att determines whether this attribute will be saved after calculations have finished. added as a sample attribute in the Nuclide Editor. 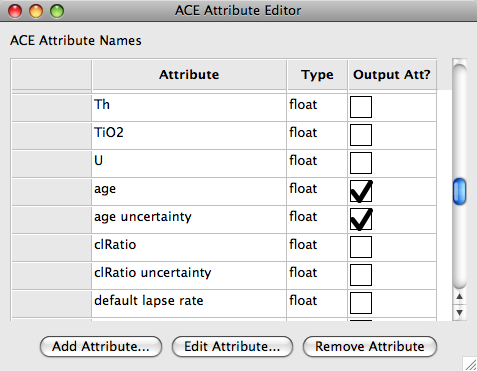 Usually this means that there is a mismatch between the attribute defined in the Attribute Editor and in the csv file, and can be fixed by modifying the attribute in the Attribute Editor.